Palestinian cartoonist Fabi Abou Hassan has long courted the ire of the Assad regime in Syria due to his scathing cartoon criticism of the regime. In recent years, Abou Hassan has been detained, arrested, and threatened, so Cartoonists Rights Network International and International Cities of Refuge Network coordinated efforts to move Abou Hassan from Syria to Drøbak, Norway. 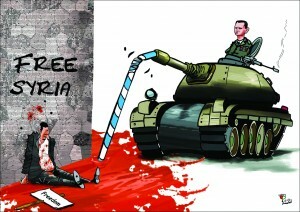 Abou Hassan is not the only cartoonist who has been persecuted in Syria. In the last few years, cartoonists have been brutally attacked, arrested, and possibly executed for challenging Assad’s government. Abou Hassan’s cartoons are frequently critical of Syria’s human rights record, the treatment of women in Syria, and political corruption. In late 2012, Abou Hassan illegally fled Syria, where he had been a refugee. Abou Hassan continues to cartoon, and many of his cartoons can be viewed on the Cartoon Movement website.